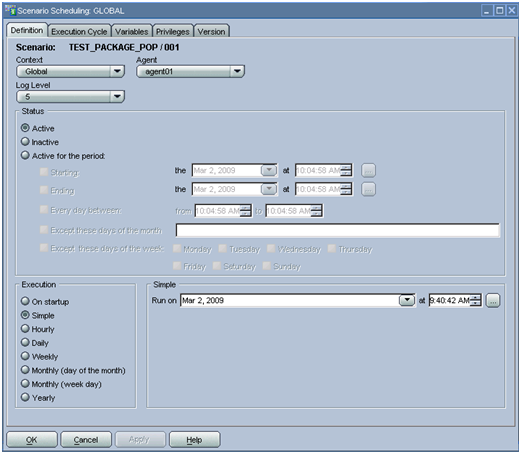 Under the scenario , right click on scheduling , click on " Insert scheduling "
Define all the scheduling parameter and the logical agent and log level. Set the Execution mode and Execution time and period. For more choice look for other tabs.Finally apply your setting and click ok. 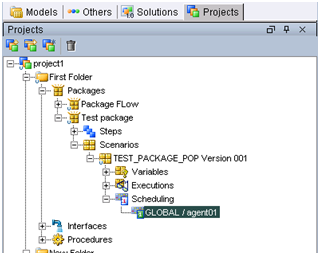 Right click on Logical Agent and Click on the " Update Scheduling " . I am new to ODI I have one issue, We scheduled Essbase data load jobs in ODI operator every week starting and sometimes “Enable DB connection failed“ issue happening when we restart the server and re-ran the odi jobs its working fine, how can we prevent this issue. Could you please help for this. I scheduled a scenario for executing every 15 minutes. It’s working fine, but ODI scheduler waits 15 minutes for next execution of the scenario. It is not including the execution time and waiting time. Let me explain you with an example for clear understanding, I have scheduled a scenario (for every 15 minutes) at 9 AM. Scenario starts execution at 9 AM and it took 240 seconds (i.e 4 minutes) for completion of execution, it means execution of scenario ends at 9:04 AM then it waits for 15 minutes and then it starts the next execution at 9:19 AM. But this should not happen, the next execution should start at 9:15 AM ( Scheduler should include execution and waiting time). Please help me how i can overcome this. Thank you for your comments. It helped. 1. There are two different environments. 2. In Env 1 if load is completed. Then we need to create a trigger to automatically start Load in Env 2. Can you please give idea on this. Please bounce your ODI agent and try the same process. There can be a lag which gets developed over the period of time. the simplest way is to create 4 hourly scheduling starting at minutes 00 – 15- 30 – 45 but in this way it could launch the process more than one time if the previous didn’t finish. Other way is to put an interval between executions in just one scheduling. I have a similar requirement, how did you resolve the issue please let me know. can someone tell me how we can schedule the scenarios bi weekly? How can one schedule ODI to run a scenario after a given number of minutes? Thanks Mike for pointing out that , its updated. i had a problem yesterday for a first time with my scheduled scenario execution, and now i have some doubts about number of attempts on failure option in Execution Cycle tab in Scenario Scheduling. There is a posibility that my extraction scenario will not be executed because of network problems, so i would consider in using option Number Of Attempts on Failure (Constraints). What i couldn’t find in documentation was time delay between attempts. So basically i would like to set execution in 3am, and if network is down, scenario would try and execute every 10 minutes, 20 times. Is there a way I can run a scenario every 10 mins (mini batch) or so using ODI not using Crontab. Can you explain how to do scheduling on linux O.S? Easy way is to Create a small shell script and call the required ODI environment variables ,then startscen.sh with required parameters and finally test the shell script and then call that script in crontab or through any external scheduler. It is given very clearly about the agent scheduling. Please let me know how can we achive parallelism in ODI with Agents. That is when there is a certain amount of work that work has to be shared equally among the multiple agents. Let me know if there is any doc which i can follow.